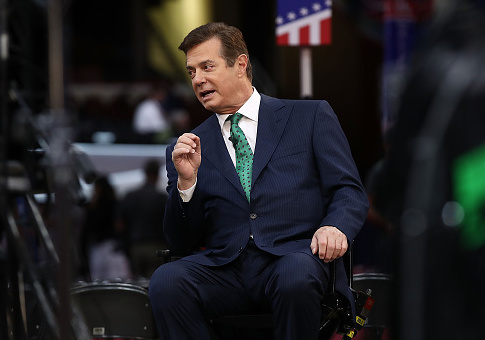 Donald Trump's former campaign chairman, Paul Manafort, filed a lawsuit in federal court on Wednesday against special counsel Robert Mueller and the Justice Department. Manafort, who in October was indicted on charges connected to the ongoing probe into Russian interference in the 2016 presidential election, alleged that the Justice Department violated the law by giving Mueller broad investigative authority that went beyond the election, CNN reports. The charges against Manafort—part of Mueller's investigation, which includes examining potential collusion between the Trump campaign and Russia—are not related to his work on the campaign. He and his deputy, Robert Gates, have pleaded not guilty to all 12 criminal counts against them, which include conspiracy to launder money and failure to file reports of foreign bank and financial accounts, among others. Now Manafort has filed suit in the U.S. District Court for the District of Columbia, arguing that Deputy Attorney General Rod Rosenstein appointed Mueller to head the special counsel without the proper authority to do so. Manafort's lawyers contend that the order to appoint Mueller exceeded Rosenstein's authority. The complaint alleges that the order violated "specific restrictions on the scope of such appointments." Its reason for that claim centers on the order saying that Mueller may investigate "any matters that arose or may arise directly from the investigation." Manafort's lawyers argue that Rosenstein cannot lawfully give Mueller authority that is so broad. Mueller was given "carte blanche to investigate and pursue criminal charges in connection with anything he stumbles across while investigating, no matter how remote from the specific matter identified as the subject of the appointment order," Manafort's lawyers said in the lawsuit. Manafort and Gates are slated to appear on Jan. 16 before a judge in the criminal case. This entry was posted in Issues and tagged Department of Justice, Lawsuit, Paul Manafort, Robert Mueller, Trump Administration. Bookmark the permalink.